Russian jurist; born at Koretz, Volhynia, Jan. 2, 1846; educated at the Jewish government school of his birthplace, at the school of the nobility in Ostrog, and at the gymnasium of Jitomir, from which he graduated with a gold medal in 1867. He studied law at the University of Kiev, from which he graduated in 1871, and then settled in St. Petersburg, where he is still (1904) practising law. 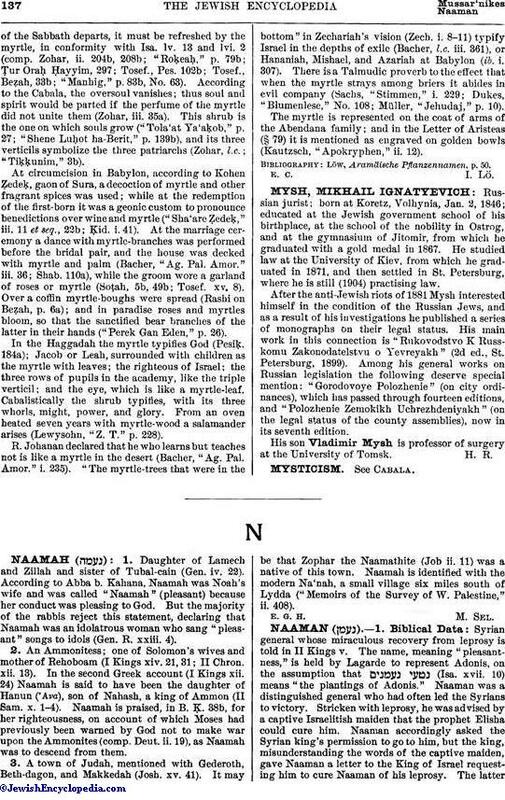 After the anti-Jewish riots of 1881 Mysh interested himself in the condition of the Russian Jews, and as a result of his investigations he published a series of monographs on their legal status. His main work in this connection is "Rukovodstvo K Russkomu Zakonodatelstvu o Yevreyakh" (2d ed., St. Petersburg, 1899). Among his general works on Russian legislation the following deserve special mention: "Gorodovoye Polozhenie" (on city ordinances), which has passed through fourteen editions, and "Polozhenie Zemokikh Uchrezhdeniyakh" (on the legal status of the county assemblies), now in its seventh edition. His son Vladimir Mysh is professor of surgery at the University of Tomsk.